Delusions are often viewed as reflecting some deficiency in reasoning ability. The risk of thinking about delusions in this way is that it encourages the belief that logical, intelligent people are incapable of delusion. An examination of the history of financial markets suggests a different view. Specifically, faced with unusual or extraordinary price advances, there is a natural tendency (particularly in the presence of crowds, feedback loops, and potential rewards) to look for explanations. The problem isn’t that logic or reason has failed, but that the inputs have been distorted, and in the attempt to justify the advance amid the speculative excitement, careful data-gathering is replaced by a tendency to confuse temporary factors for fundamental underpinnings. While true psychological delusions are different from financial ones, a similar principle is suggested by psychological research. Delusions are best understood not as deficiencies in logic, but rather as explanations that have been logically reached on the basis of distorted inputs. For example, individuals with delusions appear vulnerable to differences in perception that may involve more vivid, intense, or emotionally-charged sensory input. While those differences might be driven by neurological factors, the person experiencing these unusual perceptions looks to develop an explanation. Maher emphasized that despite the skewed input, the delusions themselves are derived by completely normal reasoning processes. Similarly, Garety & Freeman found that delusions appear to reflect not a defect in reasoning itself, but a defect “which is best described as a data-gathering bias, a tendency for people with delusions to gather less evidence” so they tend to jump to conclusions. The reason that delusions are so hard to fight with logic is that delusions themselves are established through the exercise of logic. Responsibility for delusions is more likely to be found in distorted perception or inadequate information. The problem isn’t disturbed reasoning, but distorted or inadequate inputs that the eyes, ears, and mind perceive as undeniably real. Let’s begin by examining the anatomy of speculative bubbles. We’ll follow with a discussion of three popular delusions that have taken hold of the crowd, and the premises that drive them: the delusion of paper wealth, the delusion of a booming economy, and the delusion that is Bitcoin. Across centuries of history, speculative financial bubbles have repeatedly emerged from the seeds of distorted financial environments, where speculative behavior increasingly produces self-reinforcing feedback. Specifically, the speculative behavior of the crowd results in rising prices that both impress and reward speculators, and in turn encourage even greater speculation. The more impressed the crowd becomes with the result of its own behavior, the more that behavior persists, and the more unstable the system becomes, until finally the flapping wings of a butterfly become sufficient to provoke a collapse, launching a self-reinforcing feedback loop in the opposite direction. “During the latter stage of the bull market culminating in 1929, the public acquired a completely different attitude towards the investment merits of common stocks… Why did the investing public turn its attention from dividends, from asset values, and from average earnings to transfer it almost exclusively to the earnings trend, i.e. to the changes in earnings expected in the future? The answer was, first, that the records of the past were proving an undependable guide to investment; and, second, that the rewards offered by the future had become irresistibly alluring. “Along with this idea as to what constituted the basis for common-stock selection emerged a companion theory that common stocks represented the most profitable and therefore the most desirable media for long-term investment. This gospel was based on a certain amount of research, showing that diversified lists of common stocks had regularly increased in value over stated intervals of time for many years past. “These statements sound innocent and plausible. Yet they concealed two theoretical weaknesses that could and did result in untold mischief. The first of these defects was that they abolished the fundamental distinctions between investment and speculation. The second was that they ignored the price of a stock in determining whether or not it was a desirable purchase. The 2000 tech bubble featured the same process in a slightly different form. The inputs and premises that investors observed were valid, but incomplete. Economic growth and employment were strong, and money was easy. The internet did indeed have tremendous growth prospects. But again, as the advance became more speculative, investors largely ignored the impact of their own speculation in producing that advance. Instead, their first impulse was again to try to justify the elevated valuations in novel ways (recall “price-to-eyeballs”). 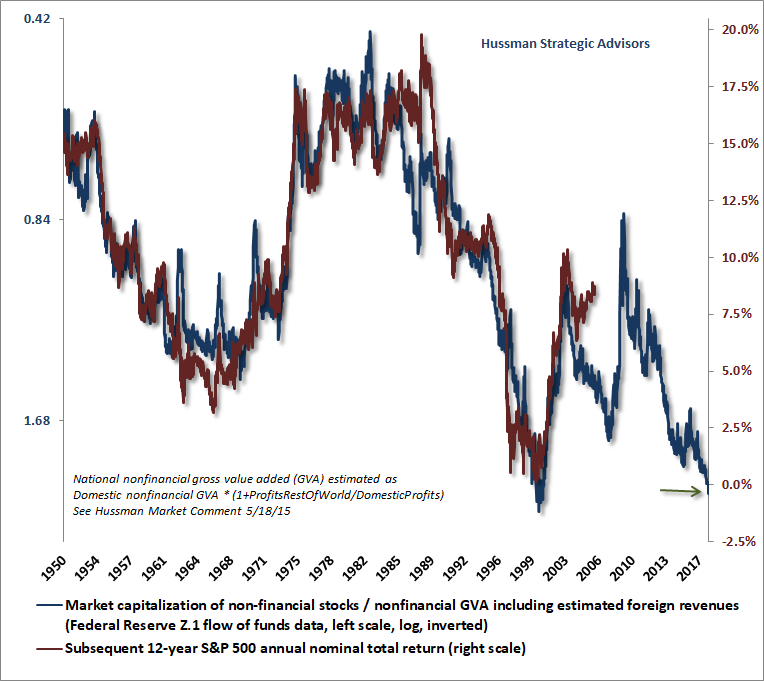 By March 2000, on the basis of historically reliable valuation measures, I projected that a retreat to normal valuations would require an -83% plunge in tech stocks. In the 19 months that followed, that estimate turned out to be precise for the tech-heavy Nasdaq 100 Index. The mortgage bubble leading up to the global financial crisis was built on the same sort of distorted inputs, this time fueled by the insistence of the Federal Reserve to hold interest rates at just 1% after the tech collapse. As yield-starved investors looked for relatively safe alternatives to low-yielding Treasury securities, they turned to mortgage securities, which had to-date never experienced major losses. Wall Street responded to the appetite for more “product” by creating new mortgage securities, which required the creation of new mortgages, and led to the creation of no-doc, zero-down mortgages and the willingness to lend to anyone with a pulse. All of this produced a glorious period of temporary prosperity and rising prices. As usual, instead of recognizing the impact of their own speculation in producing the advance, the first impulse of investors was to try to justify why elevated asset and housing valuations made sense. Missing from Yellen’s benign assessment was the fact that the speculative distortion and debt buildup enabled by the bubble itself would be the primary driver of the worst economic collapse since the Great Depression. The Fed appears to exclude such risks from its thinking, despite the fact that the worst economic collapses in history have generally gone hand-in-hand with episodes of financial speculation and their inevitable collapse. Despite risks that I fully expect to devolve into a roughly -65% loss in the S&P 500 over the completion of the current market cycle, it’s absolutely critical to distinguish the long-term effects of valuation from the shorter-term effects speculative pressure. Historically-reliable valuation measures are remarkably useful in projecting long-term and full-cycle market outcomes, but the behavior of the market over shorter segments of the market cycle is driven by the psychological inclination of investors toward speculation or risk-aversion. The most useful measure we’ve found of that psychological inclination is the uniformity or divergence of market internals across a broad range of individual stocks, industries, sectors, and security types (including debt securities of varying creditworthiness). When investors are inclined to speculate, they tend to be indiscriminate about it. Faced with extreme valuations, the first impulse of investors should not be to try to justify those valuation extremes, but to recognize the impact of their own speculative behavior in producing and sustaining those extremes. It then becomes essential to monitor market conditions for the hostile combination of extreme valuations and deteriorating market internals. In the recent advancing half-cycle, the speculation intentionally provoked by zero-interest rate policy forced us to elevate the priority of market internals to a far greater degree than was required during the tech and mortgage bubbles. It was necessary to prioritize the behavior of market internals even over extreme “overvalued, overbought, overbullish” features of market action. Those syndromes were effective in other cycles across history, but in the advancing half-cycle since 2009, our bearish response to those syndromes proved to be our Achilles Heel. The process of adaptation was very incremental, and therefore painful in the face of persistent speculation. We’ve adapted our investment discipline so that without exception, a negative market outlook can be established only in periods when our measures of market internals have also deteriorated. A neutral outlook is fine when conditions are sufficiently unfavorable, but establishing a negative outlook requires deterioration and dispersion in market internals. Faced with extreme valuations, the first impulse of investors should not be to try to justify those valuation extremes, but to recognize the impact of their own speculative behavior in producing and sustaining those extremes. It then becomes essential to monitor market conditions for the hostile combination of extreme valuations and deteriorating market internals. At present, we observe that combination, but would still characterize the deterioration in market internals as “early,” in the sense that it’s permissive of abrupt market losses, but not severe enough to infer a clear shift from speculation to risk-aversion among investors. Across history, the evaporation of paper wealth following periods of speculation has repeatedly taught a lesson that is never retained for long. Unfortunately, the lesson has to be relearned again and again because of what J.K. Galbraith referred to as “the extreme brevity of the financial memory.” Speculation is dangerous because it encourages the belief that just because prices are elevated, they must somehow actually belong there. It encourages the belief that the paper itself is wealth, rather than the stream of future cash flows that investors can expect their securities to deliver over time. This tweet was disturbing because it reflects a strikingly flawed understanding of financial markets. A moment’s reflection should make it obvious that once a security is issued, whether it’s a government bond or a dollar of base money, that security must be held by someone, at every point in time, until that security is retired. The only way to get people to invest in something “more stimulating to the economy” than government bonds is to stop issuing government bonds. It takes only a bit more thought to recognize that securities, in themselves, are not net wealth. Rather, every security is an asset to the holder, and an equivalent liability to the issuer. If Joe borrows dollars from Mary to buy something from Bob, Joe issues an IOU to Mary, Mary transfers her dollars to Joe, and the dollars end up in Bob’s hands. The IOU is a new security, but it doesn’t represent new economic wealth. It’s just evidence of the transfer of current purchasing power from Mary to Joe, and a claim on the transfer of future purchasing power from Joe to Mary. Neither the creation of securities, nor changes in their price, create net wealth or purchasing power for the economy. Yes, an individual holder of a security can obtain a transfer of wealth from someone else in the economy, provided that the holder actually sells the security to some new buyer while the price remains elevated. But in aggregate, the economy cannot consume off of its paper “wealth,” because in aggregate, those paper securities cannot be sold without someone else to buy them, and those paper securities must be held by someone until they are retired. What actually matters, in aggregate, is the stream of cash flows. Specifically, the activity that produces actual economic wealth is value-added production, which results in goods and services that did not exist previously with the same value. Value-added production is what actually “injects” purchasing power into the economy, as well as the objects available to be purchased. 4) When one nets out all the assets and liabilities in the economy, the only thing that is left – the true basis of a society’s net worth – is the stock of real investment that it has accumulated as a result of prior saving, and its unused endowment of resources. Everything else cancels out because every security represents an asset of the holder and a liability of the issuer. Securities are not net wealth. Conceptualizing the “stock of real investment” as broadly as possible, the wealth of a nation consists of its stock of real private investment (e.g. housing, capital goods, factories), real public investment (e.g. infrastructure), intangible intellectual capital (e.g. education, knowledge, inventions, organizations, and systems), and its endowment of basic resources such as land, energy, and water. In an open economy, one would include the net claims on foreigners (negative, in the U.S. case). A nation that expands and defends its stock of real, productive investment is a nation that has the capacity to generate a higher long-term stream of value-added production, and to sustain a higher long-term standard of living. Understand that securities are not net economic wealth. They are a claim of one party in the economy – by virtue of past saving – on the future output produced by others. When paper “wealth” becomes extremely elevated or depressed relative to the value-added produced by an economy, it’s the paper “wealth” that adjusts to eliminate the gap. Several years ago, I introduced what remains the single most reliable measure of valuation we’ve ever developed or tested, easily outperforming popular measures such as the Fed Model, price/forward operating earnings, the Shiller CAPE, price/NIPA profits, and a score of other alternatives. From the above discussion, it shouldn’t be surprising that this measure is based on the ratio of equity market capitalization to corporate gross-value added. Specifically, the chart below shows the market capitalization of U.S. nonfinancial equities, divided by the gross value-added of U.S. nonfinancial companies, including estimated foreign revenues. This measure is shown on an inverted log scale (blue line, left scale). 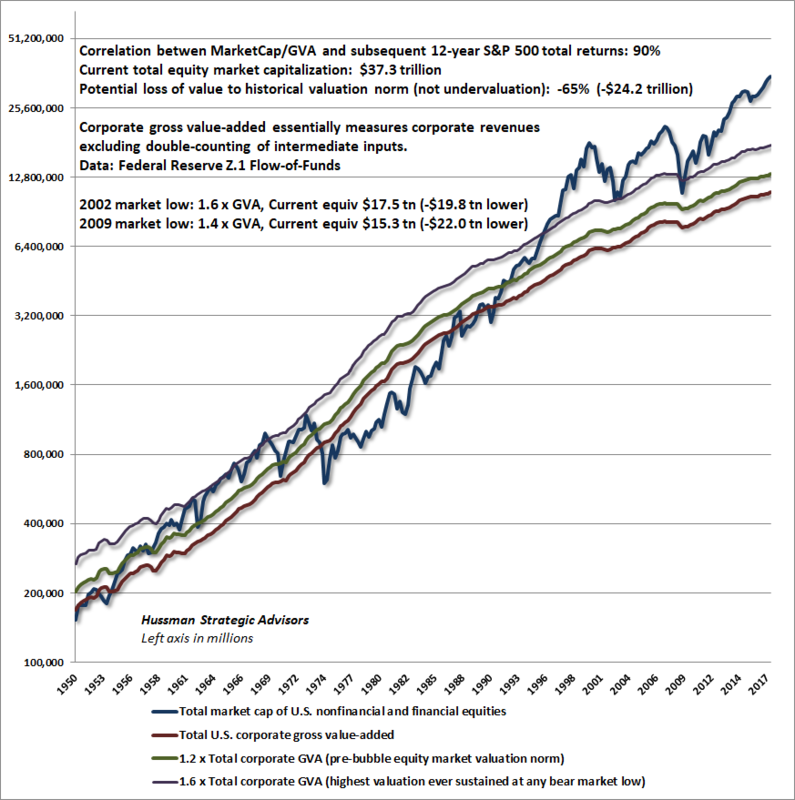 The red line shows actual subsequent S&P 500 average annual nominal total return over the following 12-year period. We prefer a 12-year horizon because that’s where the “autocorrelation profile” of valuations (the correlation between valuations at one point and valuations at any other point) reaches zero. Presently, we estimate negative total returns for the S&P 500 over the coming 12-year period. Among the valuation measures we find best correlated with actual S&P 500 total returns in market cycles across history, the S&P 500 is currently more than 2.8 times its historical norms. Importantly, this estimate of overvaluation is not somehow improved by accounting for the level of interest rates. The reason is that interest rates and economic growth rates are highly correlated across history. Lower interest rates only “justify” higher market valuations provided that the trajectory of future cash flows is held constant. But if interest rates are low because growth rates are also low (which we’ll establish in the next section below), no valuation premium is “justified” at all. When paper ‘wealth’ becomes extremely elevated or depressed relative to the value-added produced by an economy, it’s the paper ‘wealth’ that adjusts to eliminate the gap. Extending our focus beyond immediate conditions, the chart below shows the total market capitalization of nonfinancial and financial U.S. corporations, along with three lines. The lowest red line shows total gross-value added (GVA) of U.S. corporations. The green line shows 1.2 times total GVA, representing the pre-bubble norm around which market capitalization has historically traded. That green line is the level historically associated with S&P 500 total returns of roughly 10% annually, though the same level today would be associated with lower expected future returns, because structural economic growth is lower today than in the past. The purple line is essentially the most “optimistic” value-line, in that no bear market in history, including the 2002 low, has failed to reach or violate that level. The upshot is this. At present, U.S. investors are under the delusion that the $37.3 trillion of paper wealth in their equity portfolios represents durable purchasing power. Unfortunately, as in 2000 and 2007, they are likely to observe an evaporation of this paper wealth. Nobody will “get” that wealth. It will simply vanish. If a dentist in Poughkeepsie sells a single share of Apple a dime lower than the previous trade, over $500 million dollars of paper wealth is instantly wiped from the stock market. That’s how market capitalization works. Over the completion of this market cycle, we estimate that between $19.8 and $24.2 trillion in paper “wealth” will evaporate into thin air. A nation that expands and defends its stock of real, productive investment is a nation that has the capacity to generate a higher long-term stream of value-added production, and to sustain a higher long-term standard of living. While our immediate market outlook remains only moderately negative, based on the still-early deterioration we observe in market internals, recognize that from a valuation perspective, we are now witnessing the single most offensive speculative extreme in history. The chart below shows my variant of Robert Shiller’s cyclically-adjusted P/E, which substantially improves the correlation with subsequent market returns by accounting for variation in the embedded profit margin. The current extreme exceeds both the 1929 and 2000 highs. 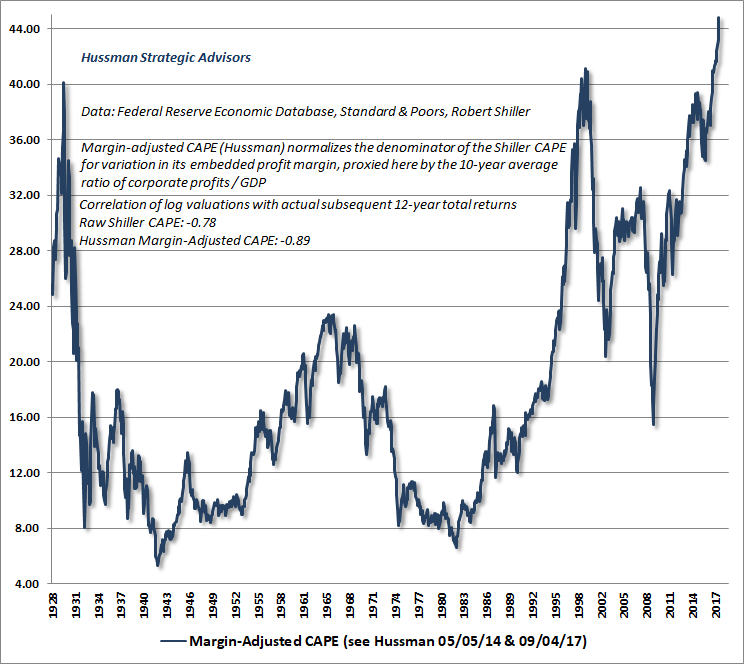 The chart below shows the correlation of our Margin-Adjusted CAPE with actual subsequent S&P 500 total returns, in nearly a century of market history. 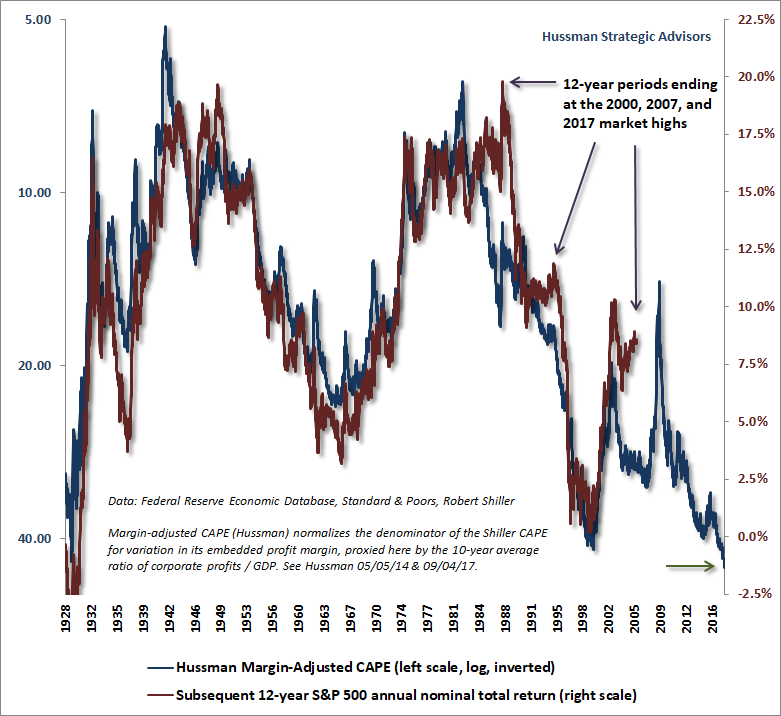 As we observe with MarketCap/GVA, the Margin-Adjusted CAPE presently implies negative expected S&P 500 total returns over the coming 12-year horizon. The central feature of both the Reagan and Kennedy tax cuts was that they were enacted at points that provided enormous slack capacity for growth. In particular, the Reagan cuts were enacted at a point where the unemployment rate had hit 10%, and an economic expansion was likely simply by virtue of cyclical mean-reversion. The Kennedy tax cuts (which brought the top marginal tax rate down from 90%) occurred as baby-boomers were just entering the labor force, again providing enormous capacity for growth. Presently, the situation is the reverse. The structural drivers of U.S. economic growth are likely to constrain real U.S. GDP growth to less than 2% annually in the coming years, even in the unlikely event that corporate tax cuts encourage increased gross domestic investment. Corporate profits are already near record levels. The effective U.S. corporate tax rate (taxes actually paid as a fraction of pre-tax income) is already at 20% even without tax cuts. We know from the 2004 repatriation holiday that tax breaks on foreign profits encouraged little but special dividends and share buybacks. Already, the available corporate surplus is being primarily driven into dividend payouts, share buybacks, and mergers and acquisitions, rather than real investment. Frankly, the notion that corporate tax cuts will unleash some renaissance in U.S. real investment and growth would be laughable if the bald-faced corporate giveaway wasn’t so offensive. The policy not only vastly favors the wealthy, but is even more preferential to wealthy individuals who take their income in the form of profits rather than wages. The current tax legislation isn’t some thoughtful reform to benefit Americans. It’s a quickly planned looting through a broken window in our nation’s character. On the subject of economic growth, an examination of the structural drivers of economic growth will illuminate the current situation. Real economic growth is the sum of two components: employment growth plus productivity growth. That means growth in the number of employed workers, plus growth in the level of output per-worker. 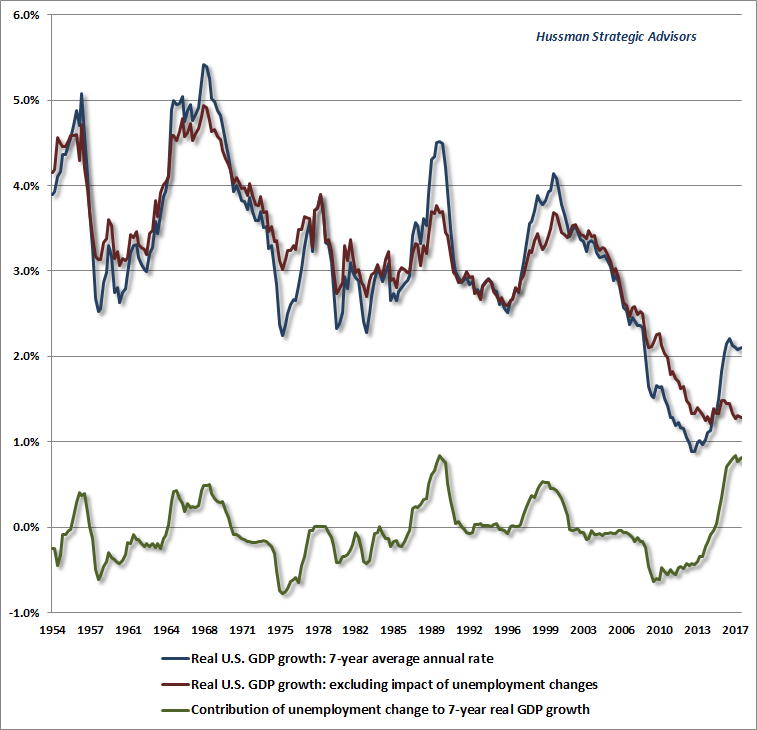 We can further break employment growth into “structural” and “cyclical” components. The structural part is determined primarily by demographics, particularly population growth and the age distribution of the working-age population. The cyclical part is determined by fluctuations in the unemployment rate (which is equal to 1-civilian employment/civilian labor force). If civilian employment grows faster than the civilian labor force, the unemployment rate falls. If the civilian labor force grows faster than civilian employment, the unemployment rate rises. The first chart below shows the civilian labor force, on a log scale (so trendlines of different slopes represent different growth rates). For much of the post-war period until about 1980, the growth rate of the civilian labor force averaged about 1.8% annually. That growth slowed to 1.2% until about 2010. That 2010 figure is 1945 plus 65; the year that the first post-war baby-boomers hit retirement age. 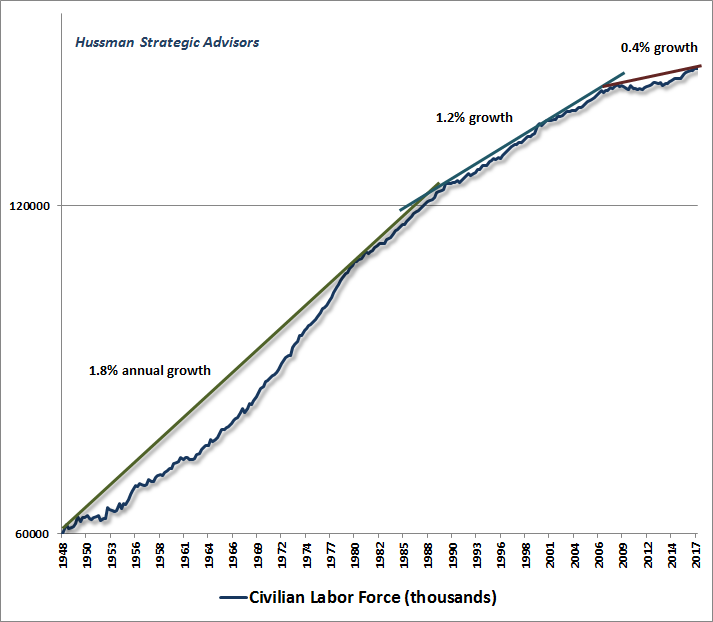 Since then, the growth rate of the civilian labor force has dropped to just 0.4% annually. That’s demographics. Now let’s take a look at productivity growth. In the early years of the post-war era, labor productivity increased at a rather explosive 2.6% annual growth rate. Growth then gradually slowed to about 1.9% annually, though in fits and starts, until about 2003. Over the past 14 years, U.S. productivity growth has slowed to just 0.6% annually. One of the core drivers of long-term productivity growth is expansion in net U.S. domestic investment (in excess of depreciation). As a general rule, booms in real U.S. investment are closely associated with deterioration in the trade deficit, because we export securities to foreigners in order to finance the boom. Because payments have to balance, this means we also export fewer goods for any given level of imports. The bottom line is that investment booms tend to be associated with larger trade deficits, so not surprisingly, booms in U.S. real investment typically emerge from a position of near-balance or surplus in the U.S. current account. 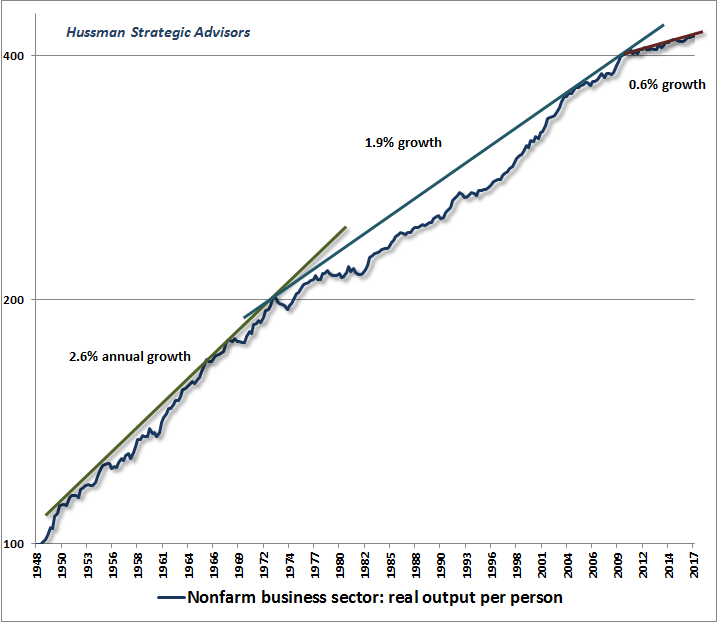 Now, add the current 0.4% growth rate in the civilian labor force to 0.6% growth in productivity, and you get the current “structural” growth rate of the U.S. economy; that is, the growth rate we would observe in the absence of changes in the unemployment rate. That structural growth rate has deteriorated to just 1% annually. The labor force component of structural growth is largely baked in the cake due to demographics, which in the absence of a substantial increase in the rate of immigration, leaves productivity growth as the main factor that could raise structural U.S. growth. Still, given civilian labor force growth of just 0.4%, even a steep acceleration of productivity growth from the current rate of 0.6% to the 1972-2008 rate of 1.9% would still produce only 2.3% structural economic growth. Anything greater than that would have to be driven by a decline in the unemployment rate from the already low level of 4.1%. It’s worth noting that U.S. economic growth has expanded at a rate of 2.1% annually in the 7-year period since 2010 (I’ve chosen a 7-year period to confine growth to the recent expansion, without including data from the global financial crisis). What’s remarkable about this is that nearly half of this growth is attributable to a decline in the U.S. unemployment rate, which is a wholly cyclical factor. The chart below shows what’s going on. The blue line shows actual 7-year real growth in U.S. GDP across history. The red line shows the “structural” component of GDP growth, excluding the effect of changes in the unemployment rate. The green line shows the contribution to 7-year growth from changes in unemployment. Put simply, in the absence of further declines in the U.S. unemployment rate, U.S. real GDP growth is likely headed toward 1% annually, not 4% annually. If our policy makers are interested in boosting long-term structural U.S. GDP growth, they should be providing direct and targeted tax incentives for real investment, education, research & development, and other factors that could, over time, increase our nation’s productive capacity. Instead, they’ve opted for a giveaway to corporations and wealthy individuals, which will likely expand the deficit while doing virtually nothing for economic growth. Since 1950, the U.S. unemployment rate has been below 4.5% about 20% of the time. Over the following 5-year period, real federal tax revenues grew at an average rate of less than 1% annually. Given current structural economic constraints, and barring a further decline in the unemployment rate from an already low 4.1%, there’s a significant likelihood that government revenues will actually contract in the coming years. The current tax legislation isn’t some thoughtful reform to benefit Americans. It’s a quickly planned looting through a broken window in our nation’s character. With regard to Bitcoin, my view is that the Blockchain algorithm itself is brilliant. Bitcoin itself, however, is just one application of Blockchain, and a rather awkward one. It’s not unique, meaning that other competing “cryptocurrencies” can be established just as easily. It’s not fiat, meaning that no country requires it to be used as legal tender. But beyond anything else, its inefficiency is so mind-boggling that the continued operation of the Bitcoin network could plausibly contribute to global warming. So be careful to distinguish Blockchain from Bitcoin. The Blockchain algorithm will undoubtedly become a useful component of validating transactions, tracking supply chain movements, and all sorts of other applications, but Bitcoin itself is likely to become the same thing to cryptocurrencies as Visicalc was to spreadsheets, or if you’re younger, what MySpace was to social networking. Bitcoin essentially uses a decentralized network of computers (anyone can join) that “listen” for transactions that are broadcast over the network. Each computer can accept and attempt to validate any “block” of transactions, which is done by discovering a particular “hash” for those transactions. The hash is a long string of ones and zeros corresponding to the input, and has to satisfy the current level of “difficulty” (specifically, a certain number of leading zeros). The difficulty is set so that only one block of transactions is validated every 10 minutes or so, across the entire network. The maximum size of a Bitcoin transaction block is 1MB, which is about 2000 transactions. That’s the total number of Bitcoin transactions that can be processed worldwide in any 10-minute interval. When you’re trying to validate a block of transactions, an extra transaction is included which designates a reward to your own account if you’re successful. Whoever discovers a hash that validates their block gets a reward, in Bitcoin. That’s what “mining” means. The validated block is added to the Blockchain – essentially a running ledger of every transaction ever made. The header for the next block has to contain the hash of the previously validated block (which is what creates the block “chain”). But here’s the thing. Every time a block is validated, a single node in the network gets a reward, and everyone else’s computing time is completely wasted. Those required computations already absorb the same amount of energy as the entire country of Denmark. Some people will get mad at that statement, arguing that it may only be half of Denmark. Ok. Ireland, along with more than 150 other countries. We can wait a few months to include Denmark. So ultimately, the Bitcoin features a combination of breathtaking inefficiency and constrained scalability. The system already features a rather steep cost per transaction, and hardly any of those transactions are for the purchase of goods and services. I’ve regularly observed that the value of a currency is essentially the present value of the stream of “services” that the currency can be expected to deliver over time, either by serving as a means of payment or as a store of value. That depends greatly on the willingness of other individuals to hold it and accept it into the indefinite future. My sense is that, as with all speculative bubbles, buyers are conflating “rising price” with “store of value.” Meanwhile, there’s little evidence to suggest that Bitcoin will ever be an efficient means of payment for ordinary goods and services. Episodes of speculation can persist for some time, so there may be some speculative profit potential in Bitcoin yet. Looking over the very long-term, it may also be worth something in the future, because value is always ascribed to things that have some combination of scarcity and usefulness. To the extent that Bitcoin is assured to have a limited supply, and is undoubtedly being used for money-laundering already, I doubt that the future value of Bitcoin will be identically zero, assuming governments refrain from any regulatory effort. There will likely be numerous alternative cryptocurrencies launched in the future, each one constructed to first enrich its originator with a large number of units, and then released in the hope that it will catch on. In evaluating these alternatives, efficiency and scalability will be worth considering. While I have little to offer in support of speculative delusions about paper wealth, improbable growth expectations, or Bitcoin, I’d be remiss to write a commentary without acknowledging the many things that can be fully embraced. From an investment standpoint, every market cycle in history has ended at valuations consistent with prospective future market returns of at least 8% annually, and more often well above 10% annually. Even if the future will be permanently different, and even 8% return prospects will never ever be seen again, the prospect of negative 12-year returns is likely to be resolved in far fewer than 12 years (as similarly poor prospects were within 2 years of the 2000 market peak). The strongest expected market return/risk classifications we identify emerge when a material retreat in valuations is joined by an early improvement in market action. While we can’t identify when that opportunity will occur, I expect that the cumulative market return between now and that point will be negative, because even a gradual 2-year improvement in prospective 12-year S&P 500 returns to just 4% would require a market loss of more than 20% over that 2-year period. In my view, a defensive posture here is an optimistic stance, because it recognizes the likelihood that prospective returns will again be positive before too long. I actually expect a much more substantial improvement in prospective market returns, but as in 2000 and 2007, that would require much deeper market losses than investors seem to contemplate. So if there is something in the financial markets to be optimistic about, it’s the prospect of opportunities that will evolve over the completion of the current market cycle. Despite extreme valuations in this cycle, we’ve learned to limit negative market outlooks to periods featuring deteriorating and divergent market internals. We observed that shift last month, but I’d still call it “early” deterioration; permissive of abrupt losses but not yet encouraging aggressive downside expectations. We’ll respond to market conditions as they change. Of course, there are so many more things to fully embrace, particularly this holiday season. To be alive, breathing, sharing humanity with others we love on this little blue and green rock, spinning around a star, floating through a vast infinity, is miracle enough to demand no delusions at all. Wishing you the joy that comes from recognizing all of your blessings. With gratitude to so many of you, who are among mine.